With so many of our merchants creating advertisements on Google & Yahoo; I thought I'd share some quick tips on getting the most out of creating a great campaign. 1) Include a keyword in your Headline title. A keyword consists of a word that describes your advertisement, business, or offer, and is used by search engines to deliver pertinent results to customers searching for related topics. For example, if you run a bakery that specializes in pies, related keywords could be applepies, pies, coconutpies, and yummypies. MarketingSherpa, a market research organization that runs extensive studies on maximinzing online marketing says, by including one of your keywords in the headline of your ad; it has the single greatest impact on generating returns. 2) Highlight your core differentiator; For example, if you're the low priced leader, include that infomation in the body of your ad. 3) Creative copy: test titillating phrases in your ad body or headline. One recent example came from an ad campaign for stock management software. The company ran multiple online ads with different headlines, varying between sensational and informational. They found that the headline "Don't bring a knife to a gun fight" resulted in a 15% jump in click throughs over any other ad. 4) Include common misspellings, use as many and the most relevant keywords you can think of for your campaigns, and exclude keywords not directly pertaining to your offer. Customers want to find relevant results and it's a rare person who runs their Google searches through a spell check first. 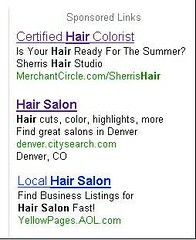 5) Include the most efficient url from your ad. For example, if you are promoting an item on sale, link directly to that item's page on your website. If you have a sophisticated website, you many even be able to generate a link that sends customers directly to your checkout page, with the item already in their shopping cart. Simplifying the purchase process for your customers will increase the chance of closing a sale.